The aerospace industry has incredibly demanding standards for parts tolerances and overall quality of manufacture. If a part is off by as little as half an inch, or if the surface condition of the part isn’t absolutely perfect, it could create a fatal flaw that impacts the safety of the aircraft. And, 35,000 feet in the air is no place to have a critical piece of equipment suffer a catastrophic failure. This is why commercial airliners need top-quality aircraft components to maintain their craft—and why commercial aviation engine companies turn to Marlin Steel for their custom ultrasonic cleaning basket needs. In fact, one custom commercial aviation engine manufacturer recently ordered a custom parts washing basket to hold their high-pressure turbine blades safely through an ultrasonic cleaning process. The blades needed to be passed through this process just after machining to ensure that no grit, metal shavings, or other contaminants would be left on the turbine blades. Otherwise, the debris from the machining process might get into the delicate internal components of the turbine engine, causing damage that puts the aircraft at severe risk of power loss mid-flight. So, how did Marlin Steel design and build the perfect custom ultrasonic cleaning basket for the client’s sensitive turbine blades—one that would ensure that no debris would be left over and that the blades themselves would be unmarred once the process was done? 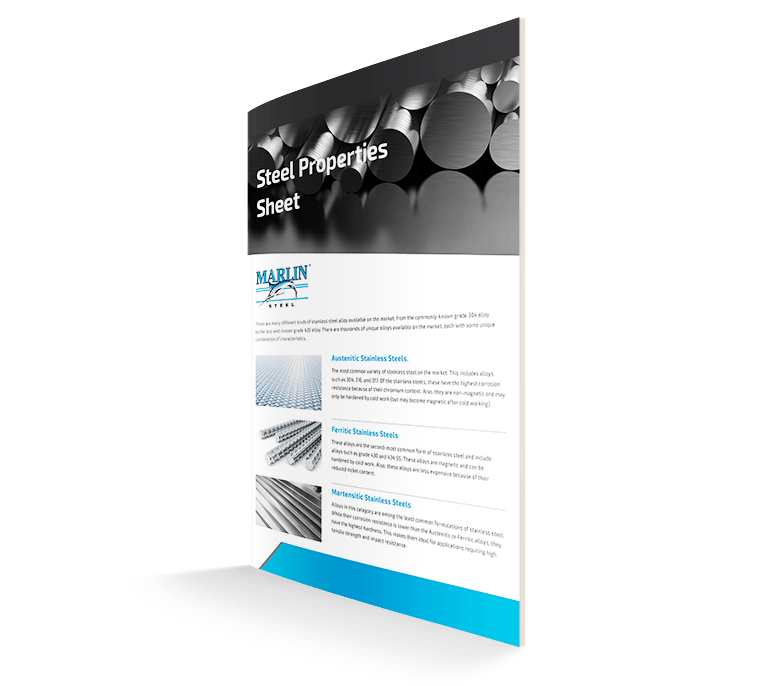 The first thing that Marlin’s engineers did was send off a custom basket questionnaire to the client asking for details about the high-pressure turbine blades, the ultrasonic cleaning system they were using, and what their requirements were for the basket itself. This information would help to ensure that the basket would meet all of the client’s requirements. After all, it’s hard to customize a basket to a part without some idea of the part’s size, shape, and materials. For example, would the turbine blades be delicate enough that contact with the bare metal of the basket would cause marring? Or, would the turbine blades be so light (or the motion of the ultrasonic cleaning machine on inserting or removing the basket be so rough) that there would a significant chance of the blades falling out of the basket? Additionally, to ensure that the basket is able to provide years of use without the need for replacement, it’s important to know exactly what forces and chemicals it will be exposed to. For example, how intense are the ultrasonic vibrations the machine uses? If the machine uses stronger vibrations, then the basket will need to be sturdier. If the machine is gentler, then thinner wires and fewer welds may be necessary. The alloy used for the basket may have to change depending on the specific chemicals used as well—since harsher chemicals may wear out some metals, while leaving others unaffected. It Takes Too Long. With testing cycles lasting weeks or months, it is almost impossible to iterate a design in a timely fashion and avoid putting production behind schedule. It Wastes Materials. The material the prototype baskets are made of aren’t free. The manufacturer has to buy the steel, spend time and labor shaping it, and then ship it off to the client. If that basket is not deemed sufficient for any reason, the design and tooling will have to be reworked and the basket scrapped and/or recycled. It Disrupts Productivity. The manufacturing line making the prototype has to be taken off of other tasks that could be more productive, wasting their time and talent on something that might not even be sellable. Once the prototype is done, they have to retool all of their equipment for a different production line. Basically, every prototype setup costs two setups’ worth of time—one for the prototype, and one for resetting the line for a different project. This leads to increased downtime for the manufacturer that they’ll have to account for in their production costs. To minimize or eliminate these drawbacks to creating prototype ultrasonic cleaning baskets, Marlin’s engineering team uses Finite Element Analysis (FEA) software. This software simulates the effects of real-world conditions on a custom parts washing basket design—breaking the CAD file of the basket into hundreds of thousands of finite elements and assessing the impacts of different stress factors on each piece. Testing that would normally take months to complete instead takes minutes. And, if the design fails the test, the reasons for the failure are clearly catalogued so they’re easier to account for in the next iteration of the design. This means less guesswork in fixing the design—leading to fewer iterations needed to achieve perfection. If a physical prototype would need four iterations to perfect it, that could be a year or more of time needed to perfect it. With FEA testing, four design iterations could be completed in an afternoon—if it would even take that many iterations to perfect the design with the notes the software provides. So, rather than waiting entire seasons for an acceptable basket design to be completed, Marlin’s clients get the perfect ultrasonic cleaning basket for their needs the first time. Once the design is finalized and approved by the FEA test, it is passed off to Marlin’s manufacturing team. Marlin’s Baltimore, Maryland-based manufacturing team takes the CAD file and uses it to program a series of factory automation tools—the specific tools vary depending on the part of the basket and the overall design. For example, Marlin often uses separate wire bending robots and welding machines to form the internal wires of a basket and secure them into place. However, when making the outer frame wires of a basket, Marlin’s engineering team often uses the Ultimat UMW-100. This machine combines the functions of a wire bending robot with a robotic welding machine, and excels at creating closed circles, squares, and rectangles—fusing the ends of the wire with an MFDC welding process that creates a solid, sturdy workpiece. Using factory automation tools makes it easier to make consistent bends and welds in a custom ultrasonic cleaning basket—ensuring that every basket Marlin makes meets the same parts tolerances and quality standards. And, because Marlin’s manufacturing facility is based in the United States near a major transportation hub, there’s little delay between when a basket is completed and when it is shipped out. There’s no red tape for customs or months-long sea voyage—the baskets get packed for shipping, placed in a truck, and is sent off. This is how Marlin is able to deliver a completed custom stainless steel basket in a fraction of the time that it would take for a foreign competitor to fill the same order (assuming they could even come close to matching Marlin’s “Made in America” quality). Need a custom ultrasonic cleaning basket on the double? 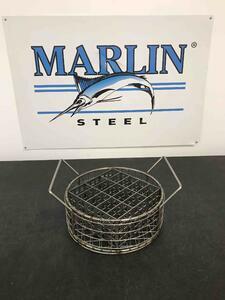 Contact the experts at Marlin Steel to get started with a custom basket quote!